Islamic terror group suffers its greatest defeat yet, losing control of northern Iraqi city after three-year reign of terror. The battle for Mosul is over, Iraq’s Prime Minister said Sunday, marking the end of the ISIS terror organization’s reign of terror in the northern Iraqi city. 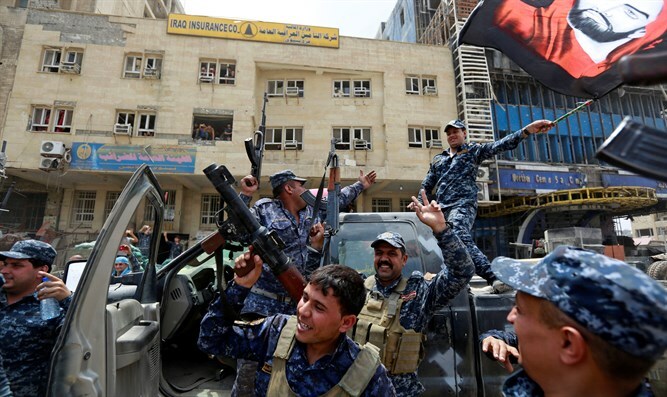 The Iraqi military’s retaking of the city is the most severe blow to ISIS the terror group has suffered yet, though the struggle against the Sunni Muslim terror organization continues in Syria and large portions of northern and western Iraq. ISIS conquered Mosul, which is located in a predominantly Kurdish region in northern Iraq, in June 2014. The loss of the city was a humiliating blow for Iraq’s security forces, and marked the zenith of the ISIS terror group’s campaign against Iraq. Following Mosul’s conquest, local Kurdish Peshmerga fighters fought pitched battles to block ISIS from advancing further into northern Iraq. After more than two years of fighting around Mosul between Kurds and other militia groups against ISIS, the Iraqi military launched an offensive last October aimed at retaking the city – and driving ISIS from northern Iraq. On Sunday, Iraqi Prime Minister Haider al-Abadi declared Mosul’s “liberation” complete. Al-Abadi toured the city Sunday, meeting with members of the Iraqi armed forces. "The commander in chief of the armed forces Haider al-Abadi arrived in the liberated city of Mosul and congratulated the heroic fighters and the Iraqi people on the achievement of the major victory," a spokesperson for al-Abadi said. A US-backed coalition aided the recapture of Mosul, providing much-needed air support and targeted bombing attacks against ISIS positions. While the city is now free from ISIS rule, much of Mosul is in ruins, destroyed during the brutal nine-month campaign to drive the Islamic terror group out.